Day Private Sailing Tour To Brač With Lunch, Wine And Beer Included! Welcome to a full day cruise around island of Brač. Step aboard and find a place to relax on our way to island of Brač. Eat lunch on board the boat and then take a swim at crystal clear water. Enjoy exploration of island of Brač and afterwards enjoy swimming, snorkeling and paddle boarding. Our mission is to offer you chilled day doing as much or as little as you like. Join us and sail away towards island of Brač. Brač is an island in the center of Dalmatia, just across Split. It is the largest island in Dalmatia and the third largest in the Adriatic Sea (area of 396 square kilometres). There are numerous settlements on island of Brač: Bol, Supetar, Postira, Sutivan, Pučišća, Sumartin and Milna. Brač is mostly known for its beach Zlatni rat in Bol, regularly listed as one of the top beaches in Europe. This beach can regularly be seen in almost any promotional video about Croatia because of its distinctive shape. Beach is in triangular shape, covered in fine sand and its peak directs in which wind blows. Brač is known for its highest peak among all Adriatic islands called Vidova gora, which offers unforgettable view over the Adriatic Sea. 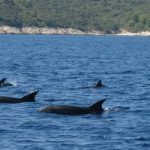 Tourism is really important to island of Brač, but fishing and agriculture are strong too. Nowadays, Island of Brač is known for its small cute villages, great bays and beaches. It strategic advantage is that it is well connected with the mainland. All of this makes it worthwhile the visit! Off we go towards town of Pučišća, a coastal town often listed as one of the prettiest villages in Europe. If you have heard about Pučišća you will probably know that town is known for its white lime stone and beautiful bay. During the Renaissance white lime stone became very popular. You can find numerous stone monuments in the town, some centuries old, some recently made by students of the stonemason school. Some of these monuments are protected as cultural goods. Stone is still one of main economies in Pučišća, there’s even a stonemason school there – only one in Croatia. You might have heard a story that pure white limestone has been used to build White House in Washington. Other sources of income for Pučišća are winemaking, fishing, olives and tourism. Once we are done with exploring town of Pučišća, we’ll make a swim stop at the bay Luke. Luke cove is situated along the northern shoreline of the island of Brač. Exact location is between town of Pučišća and town of Povlja. This bay is frequently visited by tourists who sail along the coastline of Brač. In Luke bay there are five sheltered coves and in the middle wide pebbled beach and place to dock. Here we will disembark and go swimming in crystal clear water, snorkeling and paddle boarding. Right on the beach there are showers and changing rooms. For small children, there is a playground with swings and slide. Here you can relax and take a swim. We would definitely recommend snorkeling since it is highly likely that you will see many different fish. Here you will enjoy paddle boarding and meet other who engaged in same activity. While you relax and enjoy natural beauties, you will eventually get hungry. Let our skipper and excellent chef will prepare delicious lunch for you with domestic wine and beer. In this idyllic bay you can find a small café where you drink coffee or just read newspaper. You can sunbathe on the beach; meet other people who arrived with their boats, exchange experiences and just chill. In late afternoon, while watching the sun set over the sea we leisurely return to Split. To maximize your pleasure, please don’t forget to bring bathing suit, towel, sunglasses, sunscreen and hat. We think you will have a great day and that tour will be something to remember. You will love your trip with us and remember it for a long time. Price includes: private yacht (with three cabins, living room, kitchen, bathrooms and sun deck), professional skipper, lunch, wine, beer, soft drinks, snorkeling equipment and insurance.